During the late medieval period, cotton became known as an imported fiber in northern Europe, without any knowledge of how it was derived, other than that it was a plant. Because Herodotus had written in his Histories, Book III, 106, that in India trees grew in the wild producing wool, it was assumed that the plant was a tree, rather than a shrub. This aspect is retained in the name for cotton in several Germanic languages, such as German Baumwolle, which translates as “tree wool” (Baum means “tree”; Wolle means “wool”). Noting its similarities to wool, people in the region could only imagine that cotton must be produced by plant-borne sheep. John Mandeville, writing in 1350, stated as fact the now-preposterous belief: “There grew there [India] a wonderful tree which bore tiny lambs on the endes of its branches. 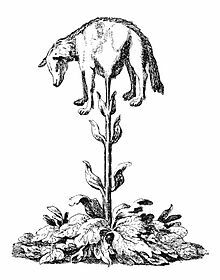 These branches were so pliable that they bent down to allow the lambs to feed when they are hungrie [sic].” (See Vegetable Lamb of Tartary.) By the end of the 16th century, cotton was cultivated throughout the warmer regions in Asia and the Americas. India’s cotton-processing sector gradually declined during British expansion in India and the establishment of colonial rule during the late 18th and early 19th centuries. This was largely due to aggressive colonialist mercantile policies of the British East India Company, which made cotton processing and manufacturing workshops in India uncompetitive. Indian markets were increasingly forced to supply only raw cotton and, by British-imposed law, to purchase manufactured textiles from Britain.